As I mentioned on my previous blog, there’s this other form of investment that can give you surprising results. For beginners who are still in a confused situation whether to invest in Mutual Fund (FAMI) or Direct Stock (COL) then I am giving you another lee way, UITF! For complete meaning of UITF kindly read HERE. So let’s start comparing the two. UITF is handled by the bank. But they only have limited banks that support this type of investment. Mutual Fund on the other hand is handled by a trusted financial advisor. Famous for this are FAMI and Sun Life. 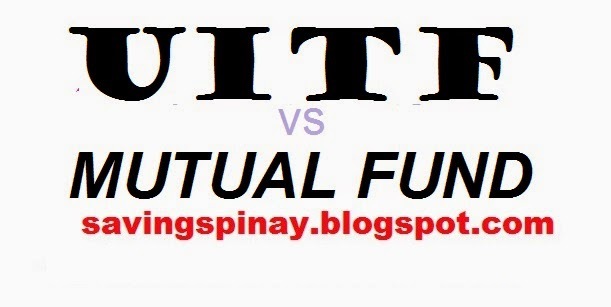 Each share in UITF is called a Unit whereas a share in Mutual is simply called a Share. UITF depends on the NAVPU or the Net Asset Value Per Share while in Mutual Fund it is NAVPS. UITF investment is for long term meaning the longer you let the number of shares stay the better. ….still contemplating for equity fund friend- UITF or FAMI, next goal ko kasi equity fund, maganda sana performance ng philequity e, bigla taas ng per share nila. Yan minsan yung problem kapag sobrang daming investment vehicles na available hehe. Di mo alam kung saan mo uunahin. My tip is to assess syempre kung hanggang saan ang kaya ng finances mo. Kaya mo ba magbayad ng ganitong halaga every month para sa investment. Also study your financial goals always. Thank you Grace! 🙂 Your blog is awesome! I really love your blogs. So helpful with newbies like me. Maraming maraming salamat po! Hope you can join the SavingsPinay Community on Facebook!! !